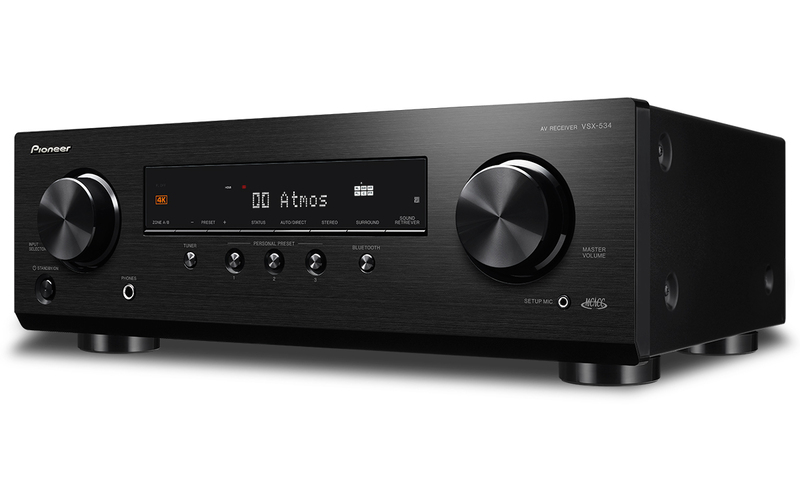 Onkyo & Pioneer Corporation is pleased to introduce a new entry-level product, the VSX-534 5.2ch AV receiver, bringing immersive Dolby Atmos® and DTS:X® theater sound precision-calibrated by MCACC*1 technology to the family or media room. This model is particularly notable for featuring a new sleek, low-profile design. An overall height of just 148 mm makes installation into a stand/rack/cabinet even easier. The good looks are matched by high performance, with deep reservoirs of power smoothly delivered through all channels courtesy of Pioneer’s Direct Energy Amplification. Equipped with a wide selection of inputs for various digital and analogue sources, the VSX-534 offers excellent audio playback quality for music, movies, TV programs, and games. Full support for Dolby Atmos and DTS:X playback. Both formats are object-based surround systems, designed to create a more immersive feeling and sense of presence than traditional surround sound systems. Pioneer’s clever microphone-based sound calibration system - “MCACC” - adjusts output to take into account variables such as speaker size and distance. This calibration system works for speakers on the wall and mounted in the ceiling as well as those on the floor. The result is seamless, lifelike Dolby Atmos and DTS:X sound quality in any room. The VSX-534 also supports two new surround technologies…Dolby Atmos Height Virtualizer and DTS Virtual:X®. These breakthrough technologies simulate the output from ‘virtual’ height and surround speakers if they are not physically present in a room. This allows for much greater flexibility when it comes to installing Dolby Atmos and DTS:X speaker set-ups. Naturally, this AV receiver is comprehensively equipped to partner state-of-the-art 4K/60p-ready media players, Ultra HD Blu-ray players, TV displays, and projectors with pass-through support for HDR10, HLG (Hybrid Log-Gamma), Dolby Vision™, and BT.2020*2 color space via HDCP 2.2-compliant HDMI® terminals. The VSX-534 offers 135 W/Ch (6 ohms, 1 kHz, THD 1.0%, 1-ch driven) for convincing and responsive surround sound. Pioneer’s tried and tested ‘Direct Energy’ circuit design ensures wide-band frequency reproduction for an expansive soundstage with excellent spatial quality when reproducing multichannel and stereo sources. Dolby Atmos and DTS:X playback is delivered via 3.2.2-channel speaker layouts. Object-based audio places sound where it would occur naturally in space, creating a lifelike audio experience for movies and games. With the addition of Dolby Atmos-enabled speakers, movie lovers can experience a convincing 3D sound-field without having to install speakers in the ceiling. DTS:X allows for the flexible placement of speakers to enable optimised playback in a variety of layouts. Owners without Dolby Atmos speakers can still enjoy many of the benefits of object-based audio, thanks to the fact that the VSX-534 also supports Dolby Atmos Height Virtualizer* and DTS Virtual:X.
DTS Neural:X and Dolby Surround technologies up-mix legacy “2D” soundtrack formats to simulate a surround-sound experience with a more seamless and cohesive front-to-back, side-to-side, and top-to-bottom envelope, producing a “wraparound” feeling. Both receivers are designed to create immersive 3D sound for movie soundtracks encoded on DVD, Blu-ray Disc™, or compatible video streaming services. HDMI Support for HDR, 4K/60p, and BT.2020 Video Formats All HDMI connections on the AV receivers support 4K/60p, 4:4:4, 24-bit video pass-through, and the HDCP 2.2 digital copy-protection standard for playback of premium content. Video with HDR*3 (High Dynamic Range) in HDR10, HLG (Hybrid Log-Gamma), or Dolby Vision™ formats is passed through to a compatible display. Further, video with BT.2020 color space for spectacular color performance is supported. Super Resolution, which is a 4K upscaling technology particularly suited to HD sources, is also included. In addition to conventional tone control, the VSX-534 also features a unique mid-range sound adjustment feature called “Dialogue Enhancement”. You can adjust the volume of predominantly mid-range sounds, such as the dialogue in films, independently with the up/down key on remote control. Connect your Wireless Headphone dock (not supplied) to the Zone B output (which extends the sound from the main zone) and you can listen via wireless headphones, ideal for late-night listening sessions. You can listen to all sound sources AVR received via the Zone B output. Bluetooth wireless technology is incorporated into VSX-534 and is a convenient audio streaming solution for almost any content playing on mobiles, tablets, and laptops, from audiobooks and podcasts to music played from smartphone applications. Pressing the “BLUETOOTH” direct key on the front panel lets you start the BT function, even when the receiver is in stand-by mode. Pioneer’s intuitive Graphical User Interface (GUI) over HDMI makes operating the receivers an intuitive, stress-free experience. The top page of the on-screen GUI displays System Setup, MCACC, and Network/Bluetooth, with quick access to each menu. A simple graphical display identifies key receiver functions, improving everyday operability, while Setup Guidance makes initial network setup very straightforward. Pioneer’s new On Screen Display (OSD) also shows detailed audio and video information during playback. The VSX-534 supports HDMI-based control function (CEC). These models allow following operations…volume adjustment/mute via TV, automatic input change when TV channel is switched or playback starts on a player, and linked power on/off with TV. *3 HDR is a technology that expands the maximum brightness of video. HDR technology is used with Ultra HD Blu-ray™ to expand the maximum brightness. • PIONEER, MCACC, Phase Control, and the logos are registered trademarks of Pioneer Corporation, and are used under license. Dolby, Dolby Atmos, Dolby Surround, Dolby TrueHD, Dolby Digital, and Dolby Vision are trademarks of Dolby Laboratories. For DTS patents, see http://patents.dts.com. Manufactured under license from DTS, Inc. DTS, the Symbol, DTS and the Symbol together, DTS:X, Virtual:X, Play-Fi, the DTS:X logo, the DTS Play-Fi logo, and the DTS Virtual:X logo are registered trademarks or trademarks of DTS, Inc. in the United States and/or other countries. © DTS, Inc. All Rights Reserved. Blu-ray Disc™, Blu-ray™, Ultra HD Blu-ray™ and the logos are trademarks of the Blu-ray Disc Association.